Mimes Brønn, Universitet på Vestlandet, Kronstad, Bergen 4th June 17.15. Featuring compositions by Jostein Stalheim and Marcus Davidson, word PAINTING sound presents works based on texts by Shakespeare and Hughes, together with a demonstration of sound painting with its creator – Walter Thompson – with live video painting by Xavier Bonete. Featuring The Sky of Consciousness by Roger Huckle and Marcus Davidson. Soundpainting is the universal multidisciplinary live composing sign language for musicians, actors, dancers, and visual Artists. The language comprises more than 1500 gestures that are signed by the Soundpainter (composer) to indicate the type of material desired of the performers. 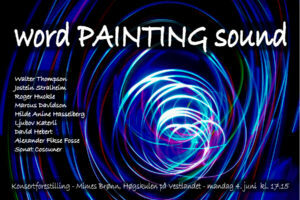 The Soundpainting language was created by Walter Thompson in Woodstock, New York in 1974.